Daimler-Benz was formed in 1926 with the merger of Daimler Motoren Gesellschaft and Benz & Cie. Prior to their merger, both companies produced aircraft engines under the respective names Mercedes and Benz. After the merger, the Daimler-Benz name was used mostly for aircraft engines, and the Mercedes-Benz name was used mostly for automobile production. However, both names were regularly applied to marine engines. For clarity in this article, the name Daimler-Benz will refer to aircraft engines, and the name Mercedes-Benz will refer to marine engines. The MB 501 shows the close family resemblance to the DB 602, but the engines had Vees of different angles and completely different valve trains. The tubes for the pushrods can be seen on the outer side of the cylinders. Note the two water pumps on the rear sides of the engine. As Germany began its rearmament campaign in the 1930s, high-performance marine diesel engines were needed to power various motorboats. The Kriegsmarine (German Navy) turned to Mercedes-Benz to supply a series of high-speed diesel engines. 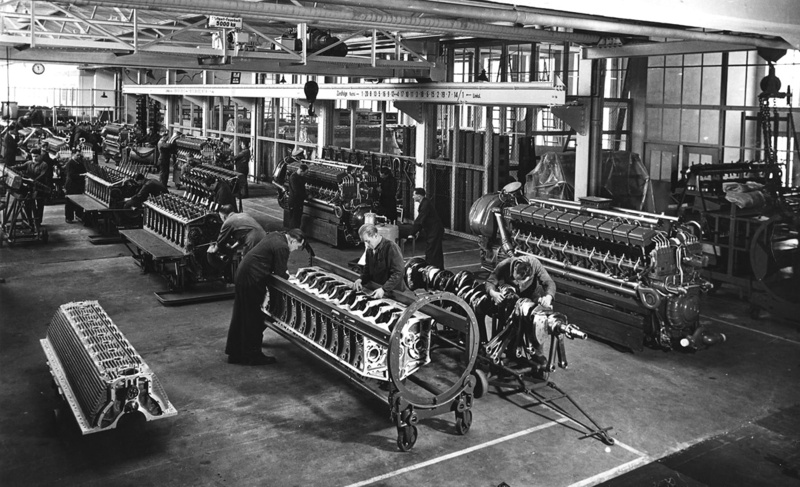 These engines were part of the MB 500 series of engines that were based on the Daimler-Benz DB 602 (LOF-2) engine developed to power the LZ 129 Hindenburg and LZ 130 Graf Zeppelin II airships. The 500 series diesel engines were four-stroke, water-cooled, and utilized a “V” cylinder arrangement. 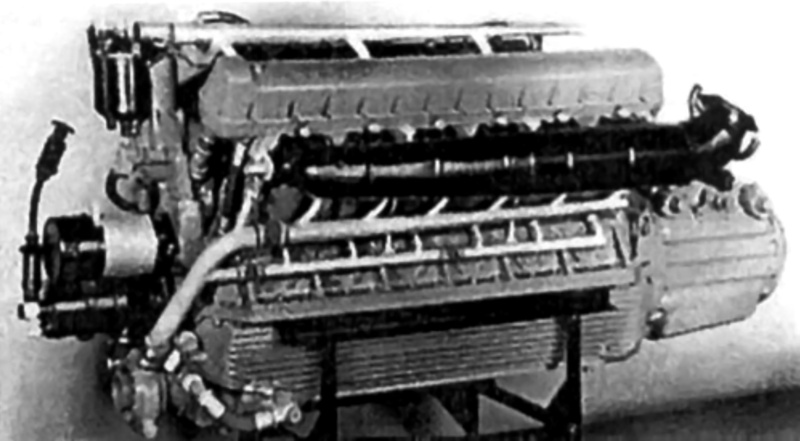 The first engine in the 500 series was the MB 500 V-12. The engine’s two cylinder banks were separated by 60 degrees. The MB 500 used individual steel cylinders that were attached to an aluminum alloy crankcase. About a third of the cylinder was above the crankcase, and the remaining two-thirds protruded into the crankcase. This arrangement helped eliminate lateral movement of the cylinders and decreased vibrations. The crankcase was made of two pieces and split horizontally through the crankshaft plane. The lower part of the crankcase was finned to increase its rigidity and help cool the engine oil. Each cylinder had two intake and two exhaust valves. The camshaft had two sets of intake and exhaust lobes per cylinder. One set was for normal operation, and the other set was for running the engine in reverse. The fore and aft movement of the camshaft to engage and disengage reverse operation was pneumatically controlled. Bosch fuel injection pumps were located at the rear of the engine and were geared to the camshaft. Each injection pump provided fuel to the cylinders at 1,600 psi (110.3 bar). Fuel was injected into the center of the pre-combustion chamber, which was in the center of the cylinder head and between the four valves. For low-speed operation, fuel was cut from one bank of cylinders. The MB 500 had a compression ratio of 16.0 to 1. The engine used fork-and-blade connecting rods that rode on roller bearings fitted to the crankshaft. The camshaft also used roller bearings, but the crankshaft was supported by plain bearings. Speed reduction of the engine’s output shaft was achieved through the use of bevel planetary gears. Two water pumps mounted to the rear sides of the engine circulated water through the cylinder banks. Each pump provided cooling water to one cylinder bank. The pumps were driven by a cross shaft at the rear of the engine. The engine was started with compressed air. With the exception of the different intake manifolds, the MB 502 was nearly identical to the DB 602. Note the Mercedes-Benz emblem on the rear of the V-16 engine. The MB 500 had a 6.89 in (175 mm) bore and a 9.06 in (230 mm) stroke. This cylinder size directly corresponded to the cylinder size used on the DB 602. The MB 500’s displacement was 4,051 cu in (66.39 L). The engine had a continuous output of 700 hp (522 kW) at 1,460 rpm and a maximum output of 950 hp (708 kW) at 1,630 rpm. Fuel consumption was .397 lb/hp/hr (241 g/kW/hr). The MB 500 was 9.6 ft (2.93 m) long, 3.2 ft (.98 m) wide, and 5.7 ft (1.73 m) tall. The engine weighed around 4,784 lb (2,170 kg). MB 500 engines were installed in Schnellboote that Germany built for Bulgaria. A Schnellboot, or S-boot, was a fast attack boat and was referred to as an E-boat (Enemy boat) by the Allies. 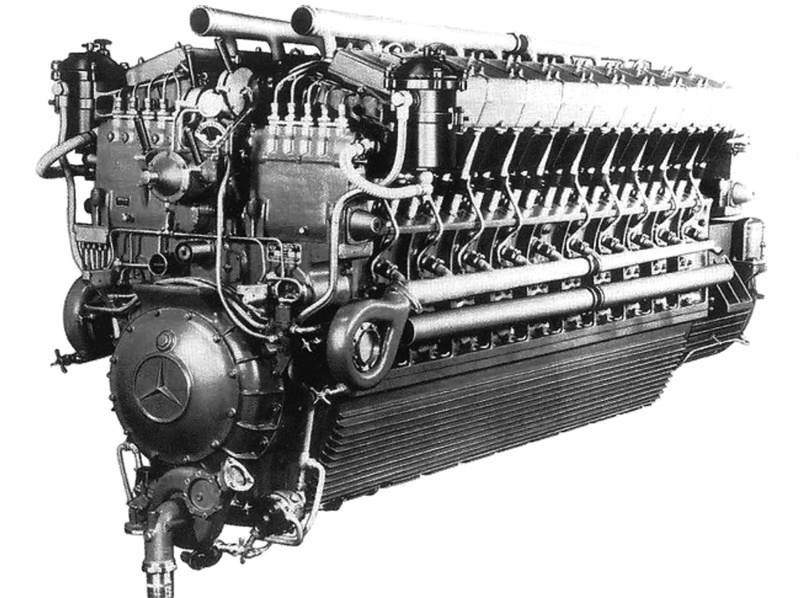 For more power, the MB 501 was built with two rows of ten cylinders, creating a V-20 engine. The MB 501 was similar to the MB 500, but it also had a number of differences. 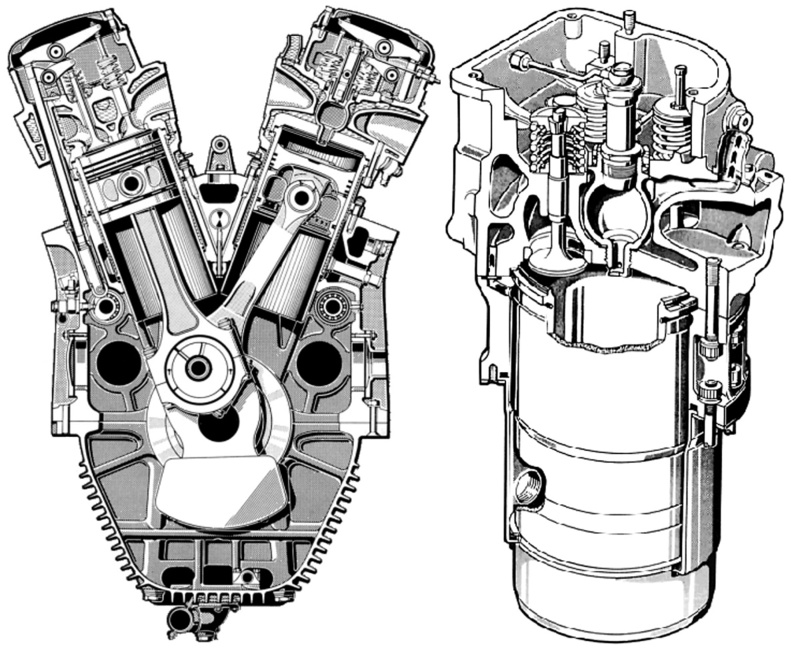 A 40 degree angle separated the cylinder banks, and the engine used two camshafts positioned in the upper crankcase, one on each side of the engine. Rollers on the lower end of the pushrods rode on the camshaft. Two pushrods for each cylinder extended up along the outer side of the cylinder bank to operate a set of duplex rocker arms for the two intake and two exhaust valves. The fork-and-blade connecting rods were attached to the crankshaft with plain bearings. The MB 507 was based on the DB 603 inverted V-12 aircraft engine. Although the engine’s architecture was similar, the MB 507 had a completely different crankcase and reduction gear than the DB 603, and it was not supercharged. The MB 501’s bore and stroke were increased over the MB 500’s to 7.28 in (185 mm) and 9.84 in (250 mm) respectively. The engine displaced 8,202 cu in (134.40 L). The MB 501 had a continuous output of 1,500 hp (1,119 kW) at 1,480 rpm and a maximum output of 2,000 hp (1,491 kW) at 1,630 rpm. Fuel consumption was .397 lb/hp/hr (241 g/kW/hr). The engine was 12.7 ft (3.88 m) long, 5.2 ft (1.58 m) wide, 5.6 ft (1.71 m) tall, and had a weight of 9,303 lb (4,220 kg). Three MB 501 engines were installed in each 1937 class Schnellboot. Six engines were installed in each of the U-180 and U-190 submarines. However, the MB 501 engines proved unsuitable in the submarines, and they were soon replaced by MAN diesels. 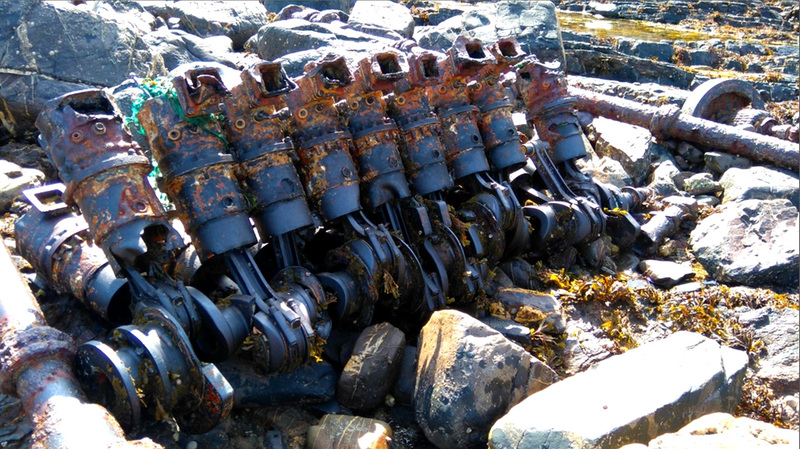 The remains of three MB 501 engines can be found on Crackington Haven Beach in southeast Britain. The engines belonged to Schnellboot S-89, which was surrendered to the British after World War II. S-89 slipped its tow on 5 October 1946 and was wrecked upon the shore. The MB 502 was essentially a Daimler-Benz DB 602, except it had water jacketed intake manifolds that protruded above the engine’s Vee. The rest of the MB 502’s specifics mirrored those of the DB 602. The MB 502 was a 50 degree V-16 with a single camshaft located in the Vee of the engine. The engine had a 6.89 in (175 mm) bore and a 9.06 in (230 mm) stroke. The MB 502 displaced 5,401 cu in (88.51 L) and had a continuous output of 900 hp (671 kW) at 1,500 rpm and a maximum output of 1,320 hp (984 kW) at 1,650 rpm. The engine was 9.9 ft (3.02 m) long, 4.0 ft (1.22 m) wide, and 6.2 ft (1.90 m) tall. The MB 502 weighed 5,952 lb (2,700 kg) and had a fuel consumption at cruising power of 0.37 lb/hp/hr (225 g/kW/hr). Three MB 502 engines were installed in each 1939 class Schnellboot. The MB 507 was based on the Daimler-Benz DB 603 inverted V-12 aircraft engine, but some features from the DB 602 were incorporated. The normally aspirated MB 507 was an upright V-12 diesel engine that used monobloc cylinders and had a compression ratio of 17 to 1. A new finned crankcase was fitted that was similar to those used on other MB 500 series diesel engines. For the initial MB 507 engines, the bore was decreased from the 6.38 in (162 mm) used on the DB 603 to 6.22 in (158 mm). The stroke was unchanged at 7.09 in (180 mm). This gave the MB 507 a displacement of 2,584 cu in (42.35 L). The DB507 weighed 1,834 lb (850 kg). The engine had a continuous output of 700 hp (522 kW) and a maximum output of 850 hp (634 kW) at 2,300 rpm. An updated version of the engine, the MB 507 C, reverted back to the 6.38 in (162 mm) bore, which increased its displacement to 2,717 cu in (44.52 L). The MB 507 C produced 750 hp at 1,950 rpm and 1,000 hp at 2,400 rpm. The engine was 6.0 ft (1.83 m) long, 2.6 ft (.79 m) wide, 3.5 ft (1.06 m) tall, and had a weight of 1,742 lb (790 kg). Two MB 507 engines were used in a few LS boats (Leicht Schnellboot or Light Fast boat), and the engine was also installed in some land vehicles, such as the Karl-Gerät self-propelled mortar. The MB 511 was a supercharged version of the MB 501 V-20 engine. The bore, stroke, and displacement were unchanged, but the compression ratio was decreased to 14 to 1. The supercharger was positioned at the front of the engine, above the gear reduction. With the supercharger, output increased to 1,875 hp (1,398 kW) at 1,480 rpm for continuous power and 2,500 hp (1,864 kW) at 1,630 rpm for maximum power. The MB 511 was 13.1 ft (4.00 m) long, 5.2 ft (1.58 m) wide, and 7.6 ft (2.33 m) tall. The engine weighed 10,406 lb (4,720 kg). Three MB 511 engines were installed in each 1939/1940 class Schnellboot. 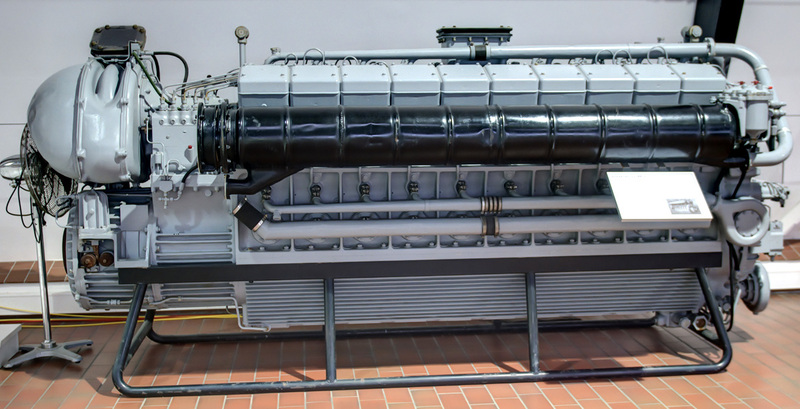 An MB 511 engine is on display in the Aeronauticum maritime aircraft museum in Nordholz (Wurster Nordseeküste), Germany. Also, the MB 511 engine was built by VEB Motorenwerk Ludwigsfelde as the 20 KVD 25 in East Germany in the 1950s. Two 20 KVD 25 engines were installed in an experimental torpedo boat. The sectional and cylinder drawing are for the MB 518 but were basically the same for the MB 501 and MB 511—all were 40 degree V-20 engines with individual cylinders. Note the pre-combustion chamber, valve train, and two camshafts. The MB 512 was a supercharged version of the MB 502. Its compression was decreased to 14 to 1, but its output increased to 900 hp (1,398 kW) at 1,500 rpm for continuous power and 1,600 hp (1,864 kW) at 1,650 rpm for maximum power. The MB 512 was 10.0 ft (3.05 m) long, 4.2 ft (1.28 m) wide, and 6.3 ft (1.92 m) tall. The engine weighed 6,834 lb (3,100 kg). MB 512 engines replaced MB 502s in some Schnellboot installations. The MB 517 diesel engine was a supercharged version of the MB 507. Returning to its DB 603 roots, the engine was inverted, but it retained the 6.22 in (158 mm) bore and 7.09 in (180 mm) stroke of the early MB 507. The supercharger boosted power from the 2,584 cu in (42.35 L) engine to 1,200 hp (895 kW) at 2,400 rpm. The MB 517 was installed in the Panzer VIII Maus V2 tank prototype. 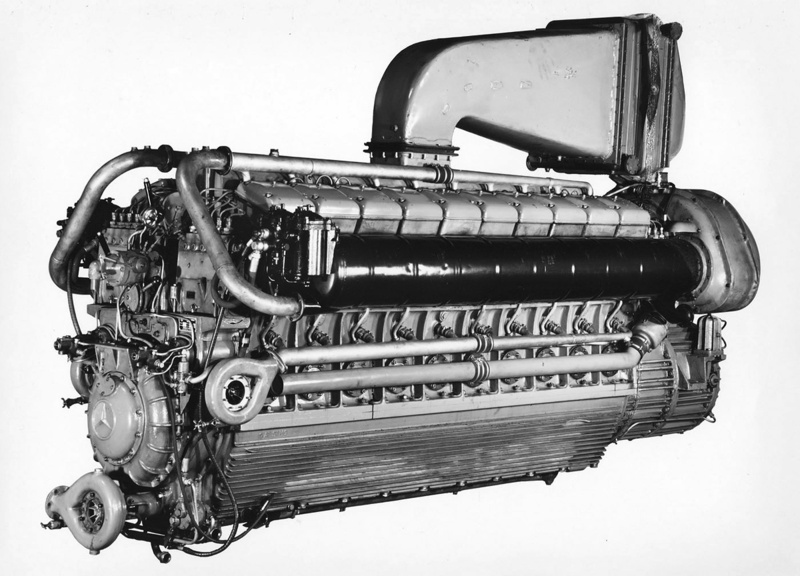 The MB 518 was the last development of the V-20 engines. This image shows the large intercooler installed on the engine’s induction system. The MB 518 was a continuation of the MB 511 and featured an intercooler. The large intercooler was positioned in the intake duct, above the engine and between the supercharger at the front of the engine and the intake manifolds in the engine’s Vee. The first MB 518s had a continuous output of 2,000 hp (1,696 kW) at 1,500 rpm and a maximum output of 3,000 hp (2,237 kW) at 1,720 rpm. After World War II, updated versions of the engine went into production starting in 1951. The MB 518 B had a continuous output of 2,275 hp (1,696 kW) and a maximum output of 3,000 hp (2,237 kW). The MB 518 C had a continuous output of 2,500 hp (1,864 kW) and a maximum output of 3,000 hp (2,237 kW). A turbocharger was added to create the MB 518 D. It had a continuous output of 2,900 hp (2,163 kW) and a maximum output of 3,500 hp (2,610 kW). 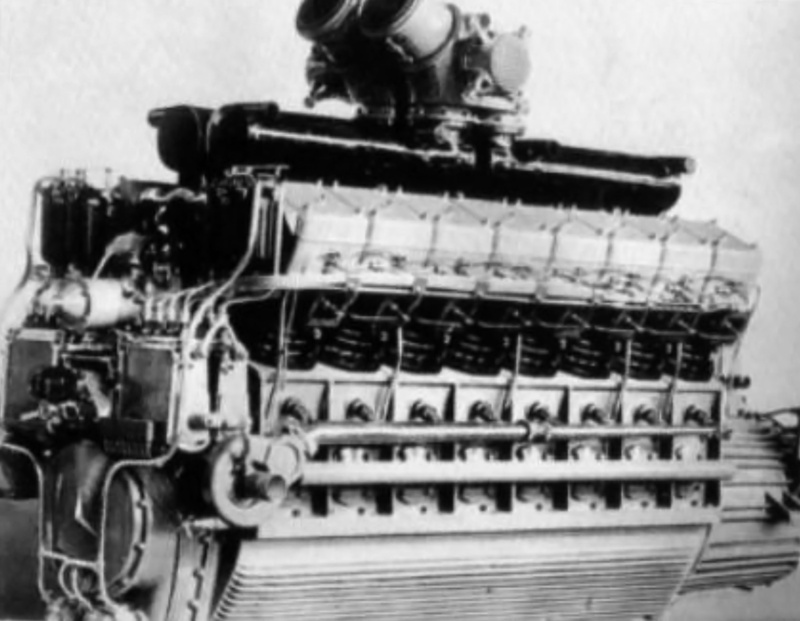 The MB 518 engine was 14.8 ft (4.52 m) long, 5.2 ft (1.58 m) wide, and 8.0 ft (2.44 m) tall. The engine weighed around 11,332 lb (5,140 kg). MB 518 engines were used to power several different vessels for the German Navy and were also exported to 35 countries. Some of the engines are still in use today. Schnellboot S-130, the only remaining German S-boot from World War II, was originally powered by three MB 511 engines. After the war, S-130 was reengined with two MB 518s, and one MB 511 was retained. S-130 is currently part of the Wheatcroft Collection and undergoing restoration. Four MB 518 C engines for the restoration were obtained from the Arthur of San Lorenzo, formerly known as the S39 Puma and originally built as a German Zobel Class fast patrol boat in the early 1960s. A number of MB 518 engines under construction show many different details. The lower crankcase half is on the floor, while the upper half is in the engine cradle; note the two camshaft tunnels. The crankshaft and its fork-and-blade connecting rods can be seen. Farther down the line is an engine with cylinder studs installed, and farther still is an engine with studs and pushrod tubes installed. This entry was posted in Diesel Engines, Marine on 5 March 2017 by William Pearce. Thank you for this website. I enjoy it immensely. Great to hear, Jetcal1. Thank you for your note. Another outstanding study. Thank you, again. William. thank you ive been restoring an old radio control Schnellboot your infomation about engines great my trade G&C motor vehicle engineering 1974, i can know tell the public about S-38 class. Great reading thanks thanks peter. Close. Sources indicate the Landkreuzer P. 1000 Ratte would have been powered by either eight Mercedes-Benz MB 501 engines or two MAN V12Z 32/44 24-cylinder engines. Which of these rather large engines were compared to the Deltic when the British Navy was looking for an engine for their patrol boats? They are gigantic! While their specific fuel consumption is good, it isn’t much better (about 25%) than the aircraft engines that were much lighter and much more powerful (and much shorter lived…) I see why the US Navy went for the Packard gas engines. Hello Jiro – I don’t know how much of a comparison was made, but yes, the British did remove the MB 501 V-20 engines in some E-boats taken from Germany after WWII and installed Deltic engines.